New Jersey Gov. Chris Christie’s spokesman attempted to shift gears Sunday after the governor and his family were photographed on Sunday lounging on a New Jersey state beach that was closed after Christie failed to pass the state budget last week. During a Sunday afternoon press conference in Trenton, Christie was asked whether he had gotten some sun that day. 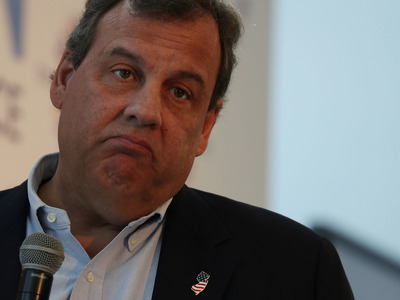 “I didn’t get any sun today,” Christie responded. But shortly after aerial photos of the governor were published on The Star-Ledger of New Jersey’s website Sunday, Christie’s spokesman, Brian Murray, had a different response to that question. The reporter who questioned Christie at the press conference also attempted to ask the governor if there were any lifeguards at Island Beach State Park, where he and his family and friends had been photographed apparently sunning and swimming. Christie responded that there weren’t any services in the park due to the shutdown, and derided the reporter for his line of questioning. “We’re talking about the closure of government and you’re talking about your TMZ stuff,” Christie said, cutting the reporter off as he was asking whether anyone was allowed to swim at the beach. “Excuse me, next, next,” Christie interrupted, moving on to another question about the state’s budget issues. The photos incited immediate and widespread outrage on social media, where the governor was parodied and pilloried for taking advantage of the beach on a holiday weekend, while regular New Jerseyans and tourists were shut out.